Jack Carstares, the disgraced Earl of Wyndam, left England seven long years ago, sacrificing his honor for that of his brother when he was accused of cheating at cards. Now Jack is back, roaming his beloved South Country in the disguise of a highwayman. Not long after Jack's return, he encounters his old adversary, the libertine Duke of Andover, attempting the abduction of the beautiful Diana Beauleigh. 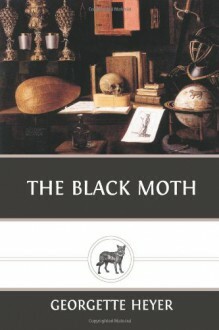 At the point of Jack's sword, the duke is vanquished, but foiled once, the "Black Moth" has no intention of failing again? My dear Mrs. Girraffee introduced me to this author. This is not one i was able to finish. I have enjoyed all the other books by this author. I intend to try again to read this book. Fun, regency romance by the master. Wonderful narrator. Fun book. It was her first. Rather well done for such a young writer.